It took about three months of the regular season for the inevitable to happen. The two-time defending champion Golden State Warriors are back to breaking the NBA. Now in the midst of a six-game winning streak, Golden State is hitting its stride at the best possible time. The games mean more in the second half of the season. It’s in this that the Warriors appear to be inspired every time they take to the court. That wasn’t the case during a stretch in November and December that saw Golden State lose six of nine. Lackadaisical play on both ends of the court led to head coach Steve Kerr calling his team out. Since then, we’ve started to run out of ways to explain this team. The latest example was a stirring 147-140 comeback win over the Pelicans at Oracle. Down by nearly 20 in the second half, Golden State rode the greatest shooter in NBA history — Stephen Curry — to a brilliant second half performance. 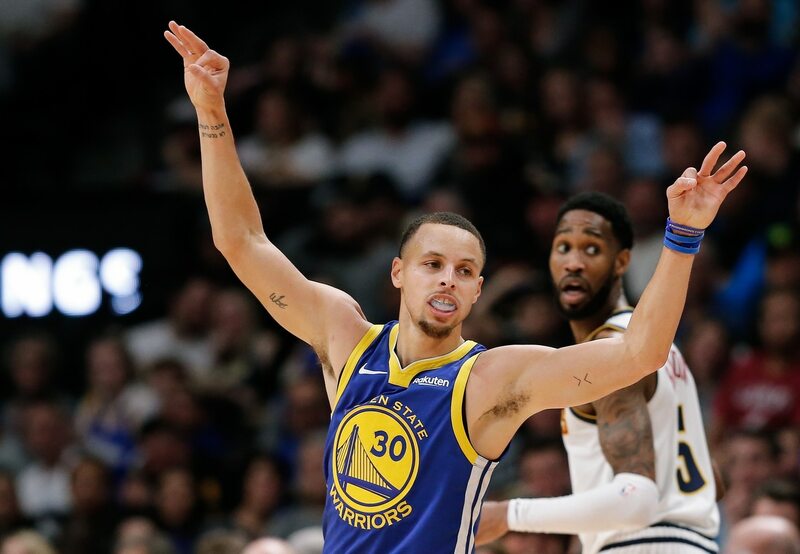 The Warriors dropped 81 points in the final two stanzas with Curry himself accounting for 23 points and six three-pointers in the third quarter alone. Stephen Curry just hit 6 threes in the third quarter. Wow. This came in the second half of a back-to-back after Golden State dropped 142 in a 31-point road win against a good Denver Nuggets team. It also saw the Warriors and Pelicans break the NBA record with a combined 43 three-pointers made — a record that Golden State and Sacramento broke back on January 5. The scary news here is that an inspired and hungry DeMarcus Cousins will make his long-awaited Warriors debut against the Clippers in Los Angeles on Friday night. If they hate you now, Cuz, just wait until the Warriors have five All-Stars starting on the same team. It’s going to be absolutely unfair. Shall we get back to the point at hand? The Warriors broke the NBA by signing Kevin Durant back in 2016. They broke the NBA by winning 73 regular season games the year before. They broke the NBA by changing the game on a dime. Literally. A pickup game with players hoisting and making threes at a clip we’ve never seen before. Curry is a prime example of this. He now has 28 three-pointers over the past three games. Michael Jordan hit 30 during his final season with the Chicago Bulls en route to leading the team to a three-peat. It’s the evolution of the game — one that Curry himself created when he started to rain threes like Prince at the old Metrodome. Seriously, it’s complete and utter ridiculousness. And it’s not even surprising. After hitting nine treys on Wednesday night, Curry has 184 in 34 games this season. The above-mentioned 1997-98 Bulls hit 311 for the entire season. While it might not be at the level of what we’re seeing from the one-man show that is James Harden in Houston, Curry’s recent run is insanity defined. Come on, son, you’re not supposed to pull up from there. That’s just dirty. Curry is averaging 34.1 points over the past seven games and has dropped 40-plus three times. That very same span has seen Klay Thompson (remember him?) drop 43 in a game. All the while, Kevin Durant and Draymond Green continue to do their thing. Kevin Durant is averaging a cool 26.7 points on 53 percent from the field during the Warriors’ six-game winning streak. Draymond? Well, Golden State was plus-41 with him on the court against Denver Tuesday night. He also put up 17 points and 14 assists while hitting four three-pointers against New Orleans. If Green is hitting that outside shot, the Warriors did indeed break the NBA. He’s also laughing in the face of the “skeptics” that conclude these Warriors are not good for the Association. “Devastating” is a word. As are calamitous and cataclysmic. However we want to coin it, these Warriors are in the process of landing a knockout punch to the rest of the NBA. At a time when the Rockets are struggling through injuries, the Lakers don’t have LeBron James, drama has been the name of the game on Boston and the Sixers are lacking continuity, these Warriors continue to troll along. They are doing so while having an absolute blast on the court. You might want to say Golden State is breaking the NBA. They’ll take that title and legitimately run through opposing teams with it — Denver and New Orleans being the two latest examples.